Many couples dream of having a honeymoon vacation Tahiti style. You've probably seen exquisite photographs of Polynesian over water bungalows suspended above an unbelievably blue lagoon. Usually they're of the most popular Tahitian island for a honeymoon, Bora Bora. Wait until you step inside one of these intimate love nests! These luxury Tahiti resorts are some of the most lavish on the planet and they can provide unique experiences that will add unforgettable spice to your first days as man and wife. Even in the age of travel, these distant, exotic islands have remained exclusive and pristine. Therefore they come at a price. But the good news is that the luxurious resorts offer honeymoon couples the best value, Tahiti vacation you will ever have in your life. Your wedding papers are a golden ticket to savings and special treats. 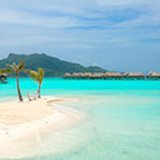 So having your honeymoon vacation in Tahiti is the best time to visit Bora Bora and other Tahitian islands. 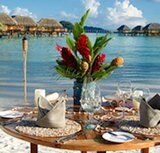 Honeymooners in Tahiti receive honeymoon bonuses such as room discounts, free room upgrades, breakfast included, complimentary spa treatments, pareos, a bedroom decked out with tropical flowers, and champagne. Just to name a few. You'll make your friends envious by frolicking in everyone's ultimate honeymoon destination! Arrive at your luxury resort's thatched-roof over water bungalow and be welcomed by a chilled bottle of champagne and a bed of fragrant tropical flowers. Wake up to a flower decorated, traditional Polynesian canoe delivering breakfast to your private deck overlooking the lagoon. Be swept away on a private lagoon cruise to enjoy snorkeling in the colorful coral gardens and a champagne picnic lunch, under the palms, on a white sand motu. Relax with a sensuous couples massage while you view the colorful marine life passing in the lagoon below the glass floor. Sail aboard a catamaran at sunset, sipping cocktails and dining with the sweet island sounds of the ukulele strumming in the background. Choosing the setting for your once in a lifetime honeymoon vacation in Tahiti is the first step. The most important decisions will be choosing which islands to visit and which glamorous resorts to stay at. All of Tahiti's beautiful islands have something fascinating for honeymooners. Here are the most popular honeymoon islands in Tahiti, and what makes each of them special. Honeymoon registries are a great idea! 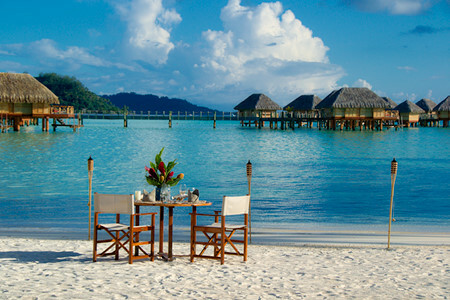 A Tahiti honeymoon registry is a free service offered by some Tahiti travel agents and resorts. 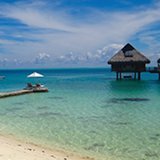 When you book your Tahiti honeymoon you can be given the choice of having a honeymoon registry set up. Then your friends and family are able to contribute towards your trip of a lifetime. They may give anything from room upgrades, to massages, to excursions, or even cocktails. 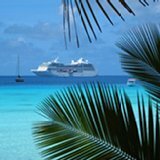 This is a way to help make your dream honeymoon vacation in Tahiti as affordable as possible. 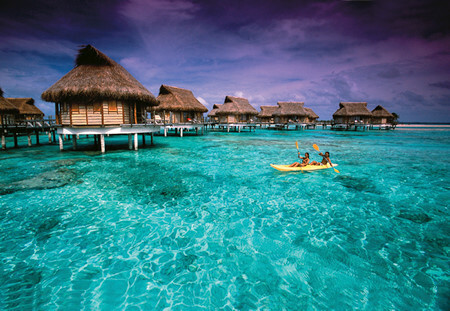 Tahiti is easily reached for a honeymoon vacation Tahiti. You have a choice of airlines and departure airports for flights to Tahiti. You have the option of flying overnight to Tahiti on the 'red eye' flight or flying over the day and arriving in Tahiti at night. We suggest you travel over the day, have breakfast in LA, lunch on Air Tahiti Nui and then dinner in the evening in Tahiti at the roulettes in Papeete. 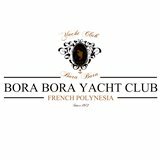 Then the next morning after a refreshing night in a Tahiti hotel, take an inter island flight to Bora Bora to begin your honeymoon in Tahiti. While passing through Papeete in Tahiti, you will want to visit the black pearl shops for a precious souvenir of your honeymoon vacation. Tahiti farms the world's most exquisite salt water pearls. Find out how to choose a Tahitian black pearl.